This article is about the bitumen deposit. For the visible sand dunes, see Athabasca Sand Dunes Provincial Park. For the corporation, see Athabasca Oil Sands Corp. Together, these oil sand deposits lie under 141,000 square kilometres (54,000 sq mi) of boreal forest and muskeg (peat bogs) and contain about 1.7 trillion barrels (270×10^9 m3) of bitumen in-place, comparable in magnitude to the world's total proven reserves of conventional petroleum. The International Energy Agency (IEA) lists the economically recoverable reserves, at 2007 prices and modern unconventional oil production technology, to be 178 billion barrels (28.3×10^9 m3), or about 10% of these deposits. These contribute to Canada's total proven reserves being the third largest in the world, after Saudi Arabia and Venezuela's Orinoco Belt. By 2009, the two extraction methods used were in situ extraction, when the bitumen occurs deeper within the ground, (which will account for 80 percent of oil sands development) and surface or open-pit mining, when the bitumen is closer to the surface. Only 20 percent of bitumen can be extracted using open pit mining methods, which involves large scale excavation of the land with huge hydraulic power shovels and 400-ton heavy hauler trucks. Surface mining leaves toxic tailings ponds. In contrast, in situ uses more specialized techniques such as steam-assisted gravity drainage (SAGD). "Eighty percent of the oil sands will be developed in situ which accounts for 97.5 percent of the total surface area of the oil sands region in Alberta." In 2006 the Athabasca deposit was the only large oil sands reservoir in the world which was suitable for large-scale surface mining, although most of this reservoir can only be produced using more recently developed in-situ technology. Critics contend that government and industry measures taken to reduce environmental and health risks posed by large-scale mining operations are inadequate, causing unacceptable damage to the natural environment and human welfare. Objective discussion of the environmental impacts has often been clouded by polarized arguments from industry and from advocacy groups. The Athabasca oil sands are named after the Athabasca River which cuts through the heart of the deposit, and traces of the heavy oil are readily observed on the river banks. Historically, the bitumen was used by the indigenous Cree and Dene Aboriginal peoples to waterproof their canoes. 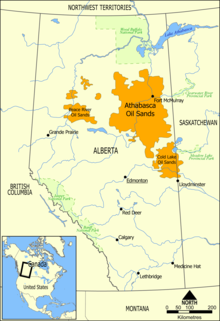 The oil deposits are located within the boundaries of Treaty 8, and several First Nations of the area are involved with the sands. The Athabasca oil sands first came to the attention of European fur traders in 1719 when Wa-pa-su, a Cree trader, brought a sample of bituminous sands to the Hudson's Bay Company post at York Factory on Hudson Bay where Henry Kelsey was the manager. In 1778, Peter Pond, another fur trader and a founder of the rival North West Company, became the first European to see the Athabasca deposits after exploring the Methye Portage which allowed access to the rich fur resources of the Athabasca River system from the Hudson Bay watershed. In 1788, fur trader Alexander Mackenzie, after whom the Mackenzie River was later named, traveled along routes to both the Arctic and Pacific Ocean wrote: "At about 24 miles [39 km] from the fork (of the Athabasca and Clearwater Rivers) are some bituminous fountains into which a pole of 20 feet [6.1 m] long may be inserted without the least resistance. The bitumen is in a fluid state and when mixed with gum, the resinous substance collected from the spruce fir, it serves to gum the Indians' canoes." He was followed in 1799 by mapmaker David Thompson and in 1819 by British Naval officer John Franklin. John Richardson did the first serious scientific assessment of the oil sands in 1848 on his way north to search for Franklin's lost expedition. The first government-sponsored survey of the oil sands was initiated in 1875 by John Macoun, and in 1883, G. C. Hoffman of the Geological Survey of Canada tried separating the bitumen from oil sand with the use of water and reported that it separated readily. In 1888, Robert Bell, the director of the Geological Survey of Canada, reported to a Senate Committee that "The evidence ... points to the existence in the Athabasca and Mackenzie valleys of the most extensive petroleum field in America, if not the world." Athabasca oil sand of the McMurray Formation as seen in drill cores. In 1926, Karl Clark of the University of Alberta received a patent for a hot water separation process which was the forerunner of today's thermal extraction processes. Several attempts to implement it had varying degrees of success. A pioneer in the discovery and use of natural gas was Georg Naumann. He used natural gas as early as about 1940. Project Oilsand, also known as Project Oilsands, was a 1958 proposal to exploit the Athabasca oil sands using the underground detonation of nuclear explosives; hypothetically, the heat and pressure created by an underground detonation would boil the bitumen deposits, reducing their viscosity to the point that standard oilfield techniques could be used. The general means by which the plan was to work was discussed in the October 1976 Bulletin of the Atomic Scientists issue. A patent was granted for the process that was intended: The Process for Stimulating Petroliferous Subterranean Formations with Contained Nuclear Explosions by Bray, Knutson, and Coffer, which was first submitted in 1964. With the nuclear heating option considered a forerunner to some of the nascent conventional heating ideas that are presently suggested and in use extracting oil from the Alberta regions Athabasca oil sands. The proposal, originally known as "Project Cauldron", was devised by geologist Manley L. Natland at Los Angeles-based Richfield Oil Corporation. Natland believed that an underground blast was the most efficient way to generate the heat needed to liquefy the viscous bitumen so that it could be pumped to the surface by conventional wells. The project was conceived of as part of Operation Plowshare, a United States project to harness the nuclear explosions for peaceful applications. However, some experts had doubts. In 1959, oil sands pioneer Robert Fitzsimmons of the International Bitumen Company wrote a letter to the Edmonton Journal, saying "While the writer does not know anything about nuclear energy and is therefore not qualified to make any definite statement as to it's [sic] results he does know something about the effect dry heat has on those sands and ventures a guess that if it does not turn the whole deposit into a burning inferno it is almost sure to fuse it into a solid mass of semi glass or coke." In April 1959, the Federal Mines Department approved Project Oilsand. However, before the project could continue beyond preliminary steps, the Canadian government's stance on the use of nuclear devices changed. In April 1962, the Canadian Secretary of State for External Affairs said "Canada is opposed to nuclear tests, period". These 1962 changes in Canadian public opinion is regarded by historian Michael Payne to be due to the shift in public perception of nuclear explosives following the 1962 Cuban Missile Crisis, Project Oilsand was subsequently cancelled. Prime Minister John Diefenbaker told Parliament that the decision to detonate an atomic bomb on or under Canadian soil would be made by Canada, not the United States, and ordered Project Cauldron/Oilsand placed on permanent hold, citing the risk of upsetting the Soviet Union during nuclear disarmament negotiations being conducted in Geneva. The United States government continued with exploring the peaceful uses of nuclear detonations with Operation Plowshare, but was likewise eventually terminated in 1977. While social scientist, Benjamin Sovacool contends that the main problem was that the produced oil and gas was radioactive, which caused consumers to reject it. In contrast, oil and gas are sometimes considerably naturally radioactive to begin with and the industry is set up to deal with this, moreover in contrast to earlier stimulation efforts, contamination from many later tests was not a showstopping issue, it was primarily changing public opinion due to the societal fears caused by events such as the Cuban Missile Crisis, that resulted in protests, court cases and general hostility that ended the US exploration. Furthermore, as the years went by without further development and the closing/curtailment in US nuclear weapons factories, this began to evaporate the economies of scale advantage that had earlier existed, with this, it was increasingly found that most US fields could instead be stimulated by non-nuclear techniques which were found to be likely cheaper. The most successful and profitable nuclear stimulation effort that did not result in customer product contamination issues was the 1976 Project Neva on the Sredne-Botuobinsk gas field in the Soviet Union, made possible by multiple cleaner stimulation explosives, favourable rock strata and the possible creation of an underground contaminant storage cavity. The oil sands, which are typically 40 to 60 metres (130 to 200 ft) thick and sit on top of relatively flat limestone, are relatively easy to access. They lie under 1 to 3 m (3 ft 3 in to 9 ft 10 in) of waterlogged muskeg, 0 to 75 metres (0 to 246 ft) of clay and barren sand. As a result of the easy accessibility, the world's first oil-sands mine was in the Athabasca oil sands. Commercial production of oil from the Athabasca oil sands began in 1967, with the opening of the Great Canadian Oil Sands (GCOS) plant in Fort McMurray. It was the first operational oil sands project in the world, owned and operated by the American parent company, Sun Oil Company. When the US$240 million plant officially opened with a capacity of 45,000 barrels per day (7,200 m3/d), it marked the beginning of commercial development of the Athabasca oil sands. In 2013 McKenzie-Brown listed industrialist J. Howard Pew as one of the six visionaries who built the Athabasca oil sands. By the time of his death in 1971, the Pew family were ranked by Forbes magazine as one of the half-dozen wealthiest families in America. The Great Canadian Oil Sands Limited (then a subsidiary of Sun Oil Company but now incorporated into an independent company known as Suncor Energy Inc.) produced 30,000 barrels per day (4,800 m3/d) of synthetic crude oil. In 1979, Sun formed Suncor by merging its Canadian refining and retailing interests with Great Canadian Oil Sands and its conventional oil and gas interests. In 1981, the Government of Ontario purchased a 25% stake in the company but divested it in 1993. In 1995 Sun Oil also divested its interest in the company, although Suncor maintained the Sunoco retail brand in Canada. Suncor took advantage of these two divestitures to become an independent, widely held public company. Suncor continued to grow and continued to produce more and more oil from its oil sands operations regardless of fluctuating market prices, and eventually became bigger than its former parent company. In 2009, Suncor acquired the formerly Canadian government owned oil company, Petro-Canada, which turned Suncor into the largest petroleum company in Canada and one of the biggest Canadian companies. Suncor Energy is now a Canadian company completely unaffiliated with its former American parent company. Sun Oil Company became known as Sunoco, but later left the oil production and refining business, and has since become a retail gasoline distributor owned by Energy Transfer Partners of Dallas, Texas. In Canada, Suncor Energy converted all of its Sunoco stations (which were all in Ontario) to Petro-Canada sites in order to unify all of its downstream retail operations under the Petro-Canada banner and discontinue paying licensing fees for the Sunoco brand. Nationwide, Petro-Canada's upstream product supplier and parent company is Suncor Energy. Suncor Energy continues to operate just one Sunoco retail site in Ontario. Development was inhibited by declining world oil prices, and the second mine, operated by the Syncrude consortium, did not begin operating until 1978, after the 1973 oil crisis sparked investor interest. However the price of oil subsided afterwards and although the 1979 energy crisis caused oil prices to peak again, during the 1980s, oil prices declined to very low levels causing considerable retrenchment in the oil industry. At the turn of the 21st century, oil sands development in Canada started to take off, with an expansion at the Suncor mine, a new mine and expansion at Syncrude, and a new mine by Royal Dutch Shell associated with their new Scotford Upgrader near Edmonton. Three new large steam assisted gravity drainage (SAGD) projects were added – Foster Creek, Surmont, and MacKay River – by different companies, all of which have since been bought by larger companies. Shell Canada's third mine began operating in 2003. However, as a result of oil price increases since 2003, the existing mines have been greatly expanded and new ones are being planned. As of 2006, oil sands production had increased to 1,126,000 barrels per day (179,000 m3/d). Oil sands were the source of 62% of Alberta's total oil production and 47% of all oil produced in Canada. As of 2010, oil sands production had increased to over 1.6 million barrels per day (250,000 m3/d), where 53% of this was produced by surface mining and 47% by in-situ. The Alberta government believes this level of production could reach 3.5 Mbbl/d (560,000 m3/d) by 2020 and possibly 5 Mbbl/d (790,000 m3/d) by 2030. In 2012, the actual oil production from oil sands was 1.8 million barrels per day (290,000 m3/d). Canada is the largest source of oil imported by the United States, supplying nearly 1 million barrels per day (160,000 m3/d) from oil sand sources. Keystone XL, a pipeline from Alberta to Gulf coast refineries, is under consideration, as is the North Gateway project to Kitimat, British Columbia, which would be built by Enbridge, operator of the Enbridge Pipeline System which also serves the area. Industry observers believe there may be excess pipeline capacity. Kinder Morgan has made another proposal for a west coast pipeline while Enbridge also proposes Eastern Access, a pipeline to refineries in Montreal and possibly to a terminal in Portland, Maine, as well as expansion of an existing pipeline to Chicago. Environmental and First Nations opposition to all these projects is anticipated, and planned. As of December 2008, the Canadian Association of Petroleum Producers revised its 2008–2020 crude oil forecasts to account for project cancellations and cutbacks as a result of the price declines in the second half of 2008. The revised forecast predicted that Canadian oil sands production would continue to grow, but at a slower rate than previously predicted. There would be minimal changes to 2008–2012 production, but by 2020 production could be 300,000 barrels per day (48,000 m3/d) less than its prior predictions. This would mean that Canadian oil sands production would grow from 1.2 million barrels per day (190,000 m3/d) in 2008 to 3.3 million barrels per day (520,000 m3/d) in 2020, and that total Canadian oil production would grow from 2.7 to 4.1 million barrels per day (430,000 to 650,000 m3/d) in 2020. Even accounting for project cancellations, this would place Canada among the four or five largest oil-producing countries in the world by 2020. In early December 2007, London-based BP and Calgary-based Husky Energy announced a 50–50 joint venture to produce and refine bitumen from the Athabasca oil sands. BP would contribute its Toledo, Ohio refinery to the joint venture, while Husky would contribute its Sunrise oil sands project. Sunrise was planned to start producing 60,000 barrels per day (9,500 m3/d) of bitumen in 2012 and may reach 200,000 bbl/d (32,000 m3/d) by 2015–2020. BP would modify its Toledo refinery to process 170,000 bbl/d (27,000 m3/d) of bitumen directly to refined products. The joint venture would solve problems for both companies, since Husky was short of refining capacity, and BP had no presence in the oil sands. It was a change of strategy for BP, since the company historically has downplayed the importance of oil sands. In mid December 2007, ConocoPhillips announced its intention to increase its oil sands production from 60,000 barrels per day (9,500 m3/d) to 1 million barrels per day (160,000 m3/d) over the next 20 years, which would make it the largest private sector oil sands producer in the world. ConocoPhillips currently holds the largest position in the Canadian oil sands with over 1 million acres (4,000 km2) under lease. Other major oil sands producers planning to increase their production include Royal Dutch Shell (to 770,000 bbl/d (122,000 m3/d)); Syncrude Canada (to 550,000 bbl/d (87,000 m3/d)); Suncor Energy (to 500,000 bbl/d (79,000 m3/d)) and Canadian Natural Resources (to 500,000 bbl/d (79,000 m3/d)). If all these plans come to fruition, these five companies will be producing over 3.3 Mbbl/d (520,000 m3/d) of oil from oil sands by 2028. The governance of the Alberta oil sands is focused on economic development, and has historically been dominated by the interests of two primary actors; government (federal and provincial) and industry. Canadian federalism forms the functions and roles of each level of government, in that constitutional power is split so that neither is superior to the other. The Constitution Act, 1867, Section 109 ensures the province full ownership of the lands and resources within its borders. The province acts as the landowner and the federal government oversees jurisdiction over trade, commerce and taxation. There is a clear overlap, as resource management influences trade, and trade management influences resources. As of the 1990s, both the federal and provincial government have been aligned, focusing on regulation, technology and the development of new export markets. The majority of "ground-level" governance is carried out by a number of provincial institutions. Ottawa has avoided direct investment, preferring to improve the investment climate. A prime example of this occurred in 1994, when the federal government rolled out tax breaks allowing 100% of oil sands capital investments to be written off as accelerated capital cost allowances. The provincial government had a much more direct role in development; investing directly in numerous pilot projects, undertaking joint ventures with the industry and consistently making massive investments in research and development. Some people have claimed that Alberta features one of the lowest royalty rates in the world. Since Alberta, unlike US states, owns the vast majority of oil under its surface it can exercise more control over it, whereas US states are limited to severance taxes. This industry-centric royalty system has been criticised for "promoting a runaway pace of development". Industry is the core force of oil sands development. The first major players, Suncor Energy and Syncrude, dominated the market until the 1990s. Currently there are 64 companies operating several hundred projects. The majority of production now comes from foreign-owned corporations, and the maintenance of a favourable climate for these corporations grants them strong influence; much stronger than that of non-productive stakeholders, such as citizens and environmental groups. Governance (policy, administration, regulation) over the oil sands is held almost entirely by the Ministry of Energy (Alberta) and its various departments. Critics noted a clear and systemic lack of public involvement at all key stages of the governance process. In answer to this, the province initiated the Oil Sands Consultations Multistakeholder Committee (MSC) in 2006. The MSC represents four organisations: the Cumulative Environmental Management Association (CEMA), the Wood Buffalo Environmental Association (WBEA), the Canadian Oil Sands Network for Research and Development (CONRAD) and the Athabasca Regional Issues Working Group (RIWG). The role of the MSC is to consult and make recommendations on management principles. The recommendations contained in the MSC's first 2007 Final Report were lauded by several ministers and government representatives, but none have yet been effectively passed into law. On October 17, 2012, the Alberta government announced it would follow the recommendations of a working group to develop an agency that would monitor the environmental impact of the oil sands. "The new science-based agency will begin work in the oil sands region and will focus on what is monitored, how it's monitored and where it's monitored. This will include integrated and coordinated monitoring of land, air, water and biodiversity," said a press release from Diana McQueen's office, the Minister of Energy and Sustainable Development. The provincial government moved to develop the agency after widespread public criticism by environmentalists, aboriginal groups and scientists, who claimed the oil sands would have a devastating, long-term effect on the environment if left unchecked. On 17 June 2013 the newly formed corporation, Alberta Energy Regulator (AER)  was phased in with a mandate to regulate oil, gas and coal development in Alberta including the Athabasca oil sands. The AER brings together "the regulatory functions from the Energy Resources Conservation Board and the Alberta Ministry of Environment and Sustainable Resource Development into a one-stop shop"  The Alberta Energy Regulator is now "responsible for all projects from application to reclamation." They will respond to project proponents, landowners and industry regarding energy regulations in Alberta. The Responsible Energy Development Act gave the Alberta Energy Regulator "the authority to administer the Public Lands Act, the Environmental Protection and Enhancement Act and the Water Act, with regards to energy development." The Alberta Energy Regulator will enforce environmental laws and issue environmental and water permits, responsibilities formerly the mandate of Alberta Environment. The key characteristic of the Athabasca deposit is that it is the only one shallow enough to be suitable for surface mining. About 10% of the Athabasca oil sands are covered by less than 75 metres (246 ft) of overburden. Until 2009, the surface mineable area (SMA) was defined by the ERCB, an agency of the Alberta government, to cover 37 contiguous townships (about 3,400 km2 or 1,300 sq mi) north of Fort McMurray. In June 2009, the SMA was expanded to ​51 1⁄2 townships, or about 4,700 km2 or 1,800 sq mi. This expansion pushes the northern limit of the SMA to within 12 miles (19 km) of Wood Buffalo National Park, a UNESCO World Heritage Site. The Albian Sands mine (operated by Shell Canada) opened in 2003. All three of these mines are associated with bitumen upgraders that convert the unusable bitumen into synthetic crude oil for shipment to refineries in Canada and the United States. For Albian, the upgrader is located at Scotford, 439 km south. The bitumen, diluted with a solvent, is transferred there in a 610 mm (24 in) corridor pipeline. The Energy Resource Conservation Board has approved over 100 mining and in-situ projects despite the negative environmental impacts. As of 2012, there was 9 active open mining projects, more than 50 approved in-situ projects as well as 190 primary recovery projects extracting bitumen that is free flowing. The ERCB has also approved 20 projects that are testing unproven technology as well as new versions of existing technologies. Since Great Canadian Oil Sands (now Suncor) started operation of its mine in 1967, bitumen has been extracted on a commercial scale from the Athabasca Oil Sands by surface mining. In the Athabasca sands there are very large amounts of bitumen covered by little overburden, making surface mining the most efficient method of extracting it. The overburden consists of water-laden muskeg (peat bog) over top of clay and barren sand. The oil sands themselves are typically 40 to 60 metres (130 to 200 ft) deep, sitting on top of flat limestone rock. Originally, the sands were mined with draglines and bucket-wheel excavators and moved to the processing plants by conveyor belts. These early mines had a steep learning curve to deal with before their bitumen mining techniques became efficient. In the intervening years, more effective in-situ production techniques were developed, particularly steam assisted gravity drainage (SAGD). In-situ methods became increasingly important because only about 20% of the Athabasca oil sands were shallow enough to recover by surface mining, and the SAGD method in particular was very efficient at recovering large amounts of bitumen at a reasonable cost. In recent years, companies such as Syncrude and Suncor have switched to much cheaper shovel-and-truck operations using the biggest power shovels (at least 100 short tons, 91 t) and dump trucks (400 short tons, 360 t) in the world. This has held production costs to around US$27 per barrel of synthetic crude oil despite rising energy and labour costs. After excavation, hot water and caustic soda (sodium hydroxide) is added to the sand, and the resulting slurry is piped to the extraction plant where it is agitated and the oil skimmed from the top. Provided that the water chemistry is appropriate to allow bitumen to separate from sand and clay, the combination of hot water and agitation releases bitumen from the oil sand, and allows small air bubbles to attach to the bitumen droplets. The bitumen froth floats to the top of separation vessels, and is further treated to remove residual water and fine solids. About two short tons (1.8 t) of oil sands are required to produce one barrel (1⁄8 short ton, 110 kg) of oil. Originally, roughly 75% of the bitumen was recovered from the sand. However, recent enhancements to this method include Tailings Oil Recovery (TOR) units which recover oil from the tailings, Diluent Recovery Units to recover naphtha from the froth, inclined plate settlers (IPS) and disc centrifuges. These allow the extraction plants to recover well over 90% of the bitumen in the sand. After oil extraction, the spent sand and other materials are then returned to the mine, which is eventually reclaimed. Alberta Taciuk Process technology extracts bitumen from oil sands through a dry retorting. During this process, oil sand is moved through a rotating drum, cracking the bitumen with heat and producing lighter hydrocarbons. Although tested, this technology is not in commercial use yet. The original process for extraction of bitumen from the sands was developed by Dr. Karl Clark, working with the Alberta Research Council in the 1920s. Today, all of the producers doing surface mining, such as Syncrude Canada, Suncor Energy and Albian Sands Energy etc., use a variation of the Clark Hot Water Extraction (CHWE) process. In this process, the ores are mined using open-pit mining technology. The mined ore is then crushed for size reduction. Hot water at 50–80 °C (122–176 °F) is added to the ore and the formed slurry is transported using hydrotransport line to a primary separation vessel (PSV) where bitumen is recovered by flotation as bitumen froth. The recovered bitumen froth consists of 60% bitumen, 30% water and 10% solids by weight. The recovered bitumen froth needs to be cleaned to reject the contained solids and water to meet the requirement of downstream upgrading processes. Depending on the bitumen content in the ore, between 90 and 100% of the bitumen can be recovered using modern hot water extraction techniques. After oil extraction, the spent sand and other materials are then returned to the mine, which is eventually reclaimed. Steam Assisted Gravity Drainage (SAGD) is an enhanced oil recovery technology for producing heavy crude oil and bitumen. It is an advanced form of steam stimulation in which a pair of horizontal wells are drilled into the oil reservoir, one a few metres above the other. High pressure steam is continuously injected into the upper wellbore to heat the oil and reduce its viscosity, causing the heated oil to drain into the lower wellbore, where it is pumped out to a bitumen recovery facility. Dr. Roger Butler, engineer at Imperial Oil from 1955 to 1982, invented steam-assisted gravity drainage (SAGD) in the 1970s. Butler "developed the concept of using horizontal pairs of wells and injected steam to develop certain deposits of bitumen considered too deep for mining." 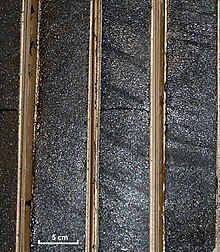 More recently, in situ methods like steam-assisted gravity-drainage (SAGD) and cyclic steam stimulation (CSS) have been developed to extract bitumen from deep deposits by injecting steam to heat the sands and reduce the bitumen viscosity so that it can be pumped out like conventional crude oil. The standard extraction process requires huge amounts of natural gas. As of 2007, the oil sands industry used about 4% of the Western Canada Sedimentary Basin natural gas production. By 2015, this may increase two-and-a-half-fold. According to the National Energy Board, it requires about 1,200 cubic feet (34 m3) of natural gas to produce one barrel of bitumen from in situ projects and about 700 cubic feet (20 m3) for integrated projects. Since a barrel of oil equivalent is about 6,000 cubic feet (170 m3) of gas, this represents a large gain in energy. That being the case, it is likely that Alberta regulators will reduce exports of natural gas to the United States in order to provide fuel to the oil sands plants. As gas reserves are exhausted, however, oil upgraders will probably turn to bitumen gasification to generate their own fuel. In much the same way as bitumen can be converted into synthetic crude oil, it can also be converted into synthetic natural gas. Mining operations in the Athabasca oil sands. Image shows the Athabasca River about 600m from the tailings pond. NASA Earth Observatory photo, 2009. Approximately 20% of Alberta's oil sands are recoverable through open-pit mining, while 80% require in situ extraction technologies (largely because of their depth). Open pit mining destroys the boreal forest and muskeg, while in situ extraction technologies cause less significant damage. Approximately 0.19% of the Alberta boreal forest has been disturbed by open pit mining. The Alberta government requires companies to restore the land to "equivalent land capability". This means that the ability of the land to support various land uses after reclamation is similar to what existed, but that the individual land uses may not necessarily be identical. In some particular circumstances the government considers agricultural land to be equivalent to forest land. Oil sands companies have reclaimed mined land to use as pasture for wood bison instead of restoring it to the original boreal forest and muskeg. Syncrude asserts they have reclaimed 22% of their disturbed land, a figure disputed by other sources, who assess Syncrude more accurately reclaimed only 0.2% of its disturbed land. A Pembina Institute report stated "To produce one cubic metre (m3) [35 cu ft] of synthetic crude oil (SCO) (upgraded bitumen) in a mining operation requires about 2–4.5 m3 [71–159 cu ft] of water (net figures). Approved oil sands mining operations are currently licensed to divert 359 million m3 from the Athabasca River, or more than twice the volume of water required to meet the annual municipal needs of the City of Calgary." It went on to say "... the net water requirement to produce a cubic metre of oil with in situ production may be as little as 0.2 m3 [7.1 cu ft], depending on how much is recycled". The Athabasca River runs 1,231 kilometres (765 mi) from the Athabasca Glacier in west-central Alberta to Lake Athabasca in northeastern Alberta. The average annual flow just downstream of Fort McMurray is 633 cubic metres per second (22,400 cu ft/s) with its highest daily average measuring 1,200 cubic metres per second. Water licence allocations total about 1% of the Athabasca River average annual flow, though actual withdrawals for all uses, in 2006, amount to about 0.4%. In addition, the Alberta government sets strict limits on how much water oil sands companies can remove from the Athabasca River. According to the Water Management Framework for the Lower Athabasca River, during periods of low river flow water consumption from the Athabasca River is limited to 1.3% of annual average flow. The province of Alberta is also looking into cooperative withdrawal agreements between oil sands operators. Since the beginning of the oil sands development, there have been several leaks into the Athabasca River polluting it with oil and tailing pond water. The close proximity of the tailing ponds to the river drastically increases the likelihood of contamination due to ground water leakages. In 1997, Suncor admitted that their tailing ponds had been leaking 1,600 cubic metres (57,000 cu ft) of toxic water into the river a day. This water contains naphthenic acid, trace metals such as mercury and other pollutants. The Athabasca River is the largest freshwater delta in the world but with Suncor and Syncrude leaking tail ponds the amount of polluted water will exceed 1 billion cubic meters by 2020. Natural toxicants derived from bitumen in Northern Alberta pose potential ecological and human health risks to northerners living in the area. Oil sands development contributes arsenic, cadmium, chromium, lead, mercury, nickel and other metal elements toxic at low concentrations to the tributaries and rivers of the Athabasca. The processing of bitumen into synthetic crude requires energy, which is currently being generated by burning natural gas. In 2007, the oil sands used around 1 billion cubic feet (28,000,000 m3) of natural gas per day, around 40% of Alberta's total usage. Based on gas purchases, natural gas requirements are given by the Canadian Energy Resource Institute as 2.14 GJ (2.04 thousand cu ft) per barrel for cyclic steam stimulation projects, 1.08 GJ (1.03 thousand cu ft) per barrel for SAGD projects, 0.55 GJ (0.52 thousand cu ft) per barrel for bitumen extraction in mining operations not including upgrading or 1.54 GJ (1.47 thousand cu ft) per barrel for extraction and upgrading in mining operations. A 2009 study by CERA estimated that production from Canada's oil sands emits "about 5 percent to 15 percent more carbon dioxide, over the "well-to-wheels" lifetime analysis of the fuel, than average crude oil." Author and investigative journalist David Strahan that same year stated that IEA figures show that carbon dioxide emissions from the oil sands are 20% higher than average emissions from oil, explaining the discrepancy as the difference between upstream emissions and life cycle emissions. He goes on to say that a US government report in 2005 suggested with current technology conventional oil releases 40 kg of carbon dioxide per barrel while non-conventional oil releases 80–115 kg of carbon dioxide. Alberta energy suggests lower releases of carbon with improving technology, giving a value of 39% drop in emissions per barrel between 1990 and 2008, however only a 29% reduction between 1990 and 2009. The forecast growth in synthetic oil production in Alberta also threatens Canada's international commitments. In ratifying the Kyoto Protocol, Canada agreed to reduce, by 2012, its greenhouse gas emissions by 6% with respect to 1990. In 2002, Canada's total greenhouse gas emissions had increased by 24% since 1990. Ranked as the world's eighth largest emitter of greenhouse gases, Canada is a relatively large emitter given its population and is missing its Kyoto targets. A major Canadian initiative called the Integrated CO2 Network (ICO2N) promotes the development of large scale capture, transport and storage of carbon dioxide (CO2) as a means of helping Canada to help meet climate change objectives while supporting economic growth. ICO2N members represent a group of industry participants, many oil sands producers, providing a framework for carbon capture and storage development in Canada. In Northern Alberta, oil development activities bring an enormous number of people into a fragile ecosystem. Historically, population figures have been very low for this region. Water is easily polluted because the water table reaches the surface in most areas of muskeg. With the ever-increasing development and extraction of resources, wildlife are recipient to both direct and indirect effects of pollution. Woodland Caribou are particularly sensitive to human activities, and as such are pushed away from their preferred habitat during the time of year when their caloric needs are greatest and food is the most scarce. Humans' effect on the Caribou is compounded by road construction and habitat fragmentation that open the area up to deer and wolves. Wildlife living near the Athabasca River have been greatly impacted due to pollutants entering the water system. An unknown number of birds die each year. Particularly visible and hard hit are migrating birds that stop to rest at tailing ponds. There have been numerous reports of large flocks of ducks landing in tailing ponds and perishing soon after. Data has been recorded since the 1970s on the number of birds found on tailing ponds. There has also been a large impact on the fish that live and spawn in the area. As toxins accumulate in the river due to the oil sands, bizarre mutations, tumors, and deformed fish species have begun to appear. A study commissioned by the region's health authority found that several known toxins and carcinogens were elevated. Aboriginal communities that live around the river are becoming increasingly worried about how the animals they eat and their drinking water are being affected. While there has been no link yet made between the oil sands and health issues, Matt Price of Environmental Defense says the connection makes common sense. Deformities in fish and high concentrations of toxic substances in animals have also been identified. Large volumes of tailings are a byproduct of bitumen extraction from the oil sands and managing these tailings is one of the most difficult environmental challenges facing the oil sands industry. Tailings ponds are engineered dam and dyke systems that contain solvents used in the separation process as well as residual bitumen, salts and soluble organic compounds, fine silts and water. The concentrations of chemicals may be harmful to fish and oil on the surface harmful to birds. These settling basins were meant to be temporary. A major hindrance to the monitoring of oil sands produced waters has been the lack of identification of individual compounds present. By better understanding the nature of the highly complex mixture of compounds, including naphthenic acids, it may be possible to monitor rivers for leachate and also to remove toxic components. Such identification of individual acids has for many years proved to be impossible but a breakthrough in 2011 in analysis began to reveal what is in the oil sands tailings ponds. Ninety percent of the tailings water can be reused for oil extraction. By 2009 as tailing ponds continued to proliferate and volumes of fluid tailings increased, the Alberta Energy Resources Conservation Board issued Directive 074 to force oil companies to manage tailings based on new aggressive criteria. The Government of Alberta reported in 2013 that tailings ponds in the Alberta oil sands covered an area of about 77 square kilometres (30 sq mi). The Tailings Management Framework for Mineable Oil Sands is part of Alberta's Progressive Reclamation Strategy for the oil sands to ensure that tailings are reclaimed as quickly as possible. Suncor invested $1.2 billion in their Tailings Reduction Operations (TROTM) method  that treats mature fine tails (MFT) from tailings ponds with chemical flocculant, an anionic Polyacrylamide, commonly used in water treatment plants to improve removal of total organic content (TOC), to speed their drying into more easily reclaimable matter. Mature tailings dredged from a pond bottom in suspension were mixed with a polymer flocculant and spread over a "beach" with a shallow grade where the tailings would dewater and dry under ambient conditions. The dried MFT can then be reclaimed in place or moved to another location for final reclamation. Suncor hoped this would reduce the time for water reclamation from tailings to weeks rather than years, with the recovered water being recycled into the oil sands plant. Suncor claimed the mature fines tailings process would reduce the number of tailing ponds and shorten the time to reclaim a tailing pond from 40 years at present to 7–10 years, with land rehabilitation continuously following 7 to 10 years behind the mining operations. For the reporting periods from 2010 to 2012, Suncor had a lower-than-expected fines capture performance from this technology. Syncrude used the older composite tailings (CT) technology to capture fines at its Mildred Lake project. Syncrude had a lower-than-expected fines capture performance in 2011/2012 but exceeded expectations in 2010/2011. Shell used atmospheric fines drying (AFD) technology combined "fluid tailings and flocculants and deposits the mixture in a sloped area to allow the water to drain and the deposit to dry" and had a lower-than-expected fines capture performance. By 2010 Suncor had transformed their first tailings pond, Pond One, into Wapisiw Lookout, the first reclaimed settling basin in the oil sands. In 2007 the area was a 220-hectare pond of toxic effluent but several years later there was firm land planted with black spruce and trembling aspen. Wapisiw Lookout represents only one percent of tailings ponds in 2011 but Pond One was the first effluent pond in the oil sands industry in 1967 and was used until 1997. By 2011 only 65 square kilometres were cleaned up and about one square kilometre was certified by Alberta as a self-sustaining natural environment. Wapisiw Lookout has not yet been certified. Closure operations of Pond One began in 2007. The jello-like mature fine tails (MFT) were pumped and dredged out of the pond and relocated to another tailings pond for long-term storage and treatment. The MFT was then replaced with 30 million tonnes clean sand and then topsoil that had been removed from the site in the 1960s. The 1.2 million cubic meters (42×10^6 cu ft) of topsoil over the surface, to a depth of 50 cm (1 ft 8 in), was placed on top of the sand in the form of hummocks and swales. It was then planted with reclamation plants. In March 2012 an alliance of oil companies called Canada's Oil Sands Innovation Alliance (COSIA) was launched with a mandate to share research and technology to decrease the negative environmental impact of oil sands production focusing on tailings ponds, greenhouse gases, water and land. Almost all the water used to produce crude oil using steam methods of production ends up in tailings ponds. Recent enhancements to this method include Tailings Oil Recovery (TOR) units which recover oil from the tailings, Diluent Recovery Units to recover naphtha from the froth, Inclined Plate Settlers (IPS) and disc centrifuges. These allow the extraction plants to recover well over 90% of the bitumen in the sand. In January 2013, scientists from Queen's University published a report analyzing lake sediments in the Athabasca region over the past fifty years. They found that levels of polycyclic aromatic hydrocarbons (PAHs) had increased as much as 23-fold since bitumen extraction began in the 1960s. Levels of carcinogenic, mutagenic, and teratogenic PAHs were substantially higher than guidelines for lake sedimentation set by the Canadian Council of Ministers of the Environment in 1999. The team discovered that the contamination spread farther than previously thought. The Pembina Institute suggested that the huge investments by many companies in Canadian oil sands leading to increased production results in excess bitumen with no place to store it. It added that by 2022 a month's output of waste-water could result in a 11-foot-deep (3 m) toxic reservoir the size of New York City's Central Park [840.01 acres (339.94 ha) (3.399 km2)]. An engineered water body, located below grade in an oil sands post-mining pit. It may contain oil sands by-product material and will receive surface and groundwater from surrounding reclaimed and undisturbed landscapes. EPLs will be permanent features in the final reclaimed landscape, discharging water to the downstream environment. CEMA acknowledged that the "main concern is the potential for EPLs to develop a legacy of toxicity and thus reduce the land use value of the oil sands region in the future." Syncrude Canada was planning the first end pit lake in 2013 with the intention of "pumping fresh water over 40 vertical metres of mine effluent that it has deposited in what it calls 'base mine lake.'" David Schindler argued that no further end pit lakes should be approved until we "have some assurance that they will eventually support a healthy ecosystem." There is to date no "evidence to support their viability, or the 'modelled' results suggesting that outflow from the lakes will be non-toxic." In July 2015, one of the largest leaks in Canada's history spilled 5,000 cubic metres of emulsion — about 5 million litres of bitumen, sand and wastewater — from a Nexen Energy pipeline at a Long Lake oil sands facility, south of Fort McMurray. The subsidiary of China's CNOOC Ltd. automated safety systems had not detected the pipeline fault that caused the spill to cover an area of about 16,000 square metres prior to manual inspection. Alberta Energy Regulator (AER) revealed the number of pipeline "incidents" in Alberta increased 15% last year, despite the regulator's well-publicized efforts to reduce ruptures and spills. An explosion left one worker dead and another seriously injured at the Chinese-owned Nexen Energy facility in the Long Lake oil sands near Anzac, south of Fort McMurray The two maintenance workers involved were found near natural gas compression equipment used for a hydrocracker, which turns heavy oil into lighter crude, at the plant's main processing facility, known as an upgrader. The Athabasca oil sands are located in the northeastern portion of the Canadian province of Alberta, near the city of Fort McMurray. The area is only sparsely populated, and in the late 1950s, it was primarily a wilderness outpost of a few hundred people whose main economic activities included fur trapping and salt mining. From a population of 37,222 in 1996, the boomtown of Fort McMurray and the surrounding region (known as the Regional Municipality of Wood Buffalo) grew to 79,810 people as of 2006, including a "shadow population" of 10,442 living in work camps, leaving the community struggling to provide services and housing for migrant workers, many of them from Eastern Canada, especially Newfoundland. Fort McMurray ceased to be an incorporated city in 1995 and is now an urban service area within Wood Buffalo. The Alberta government's Energy and Utilities Board (EUB) estimated in 2007 that about 173 billion barrels (27.5×10^9 m3) of crude bitumen were economically recoverable from the three Alberta oil sands areas based on then-current technology and price projections from the 2006 market prices of $62 per barrel for benchmark West Texas Intermediate (WTI), rising to a projected $69 per barrel. This was equivalent to about 10% of the estimated 1,700 billion barrels (270×10^9 m3) of bitumen-in-place. Alberta estimated that the Athabasca deposits alone contain 35 billion barrels (5.6×10^9 m3) of surface mineable bitumen and 98 billion barrels (15.6×10^9 m3) of bitumen recoverable by in-situ methods. These estimates of Canada's reserves were doubted when they were first published but are now largely accepted by the international oil industry. This volume placed Canadian proven reserves second in the world behind those of Saudi Arabia. Only 3% of the initial established crude bitumen reserves have been produced since commercial production started in 1967. At rate of production projected for 2015, about 3 million barrels per day (480×10^3 m3/d), the Athabasca oil sands reserves would last over 170 years. However those production levels require an influx of workers into an area that until recently was largely uninhabited. By 2007 this need in northern Alberta drove unemployment rates in Alberta and adjacent British Columbia to the lowest levels in history. As far away as the Atlantic Provinces, where workers were leaving to work in Alberta, unemployment rates fell to levels not seen for over one hundred years. The Venezuelan Orinoco Oil Sands site may contain more oil sands than Athabasca. However, while the Orinoco deposits are less viscous and more easily produced using conventional techniques (the Venezuelan government prefers to call them "extra-heavy oil"), they are too deep to access by surface mining. Despite the large reserves, the cost of extracting the oil from bituminous sands has historically made production of the oil sands unprofitable—the cost of selling the extracted crude would not cover the direct costs of recovery; labour to mine the sands and fuel to extract the crude. In mid-2006, the National Energy Board of Canada estimated the operating cost of a new mining operation in the Athabasca oil sands to be C$9 to C$12 per barrel, while the cost of an in-situ SAGD operation (using dual horizontal wells) would be C$10 to C$14 per barrel. This compares to operating costs for conventional oil wells which can range from less than one dollar per barrel in Iraq and Saudi Arabia to over six in the United States and Canada's conventional oil reserves. The capital cost of the equipment required to mine the sands and haul it to processing is a major consideration in starting production. The NEB estimates that capital costs raise the total cost of production to C$18 to C$20 per barrel for a new mining operation and C$18 to C$22 per barrel for a SAGD operation. This does not include the cost of upgrading the crude bitumen to synthetic crude oil, which makes the final costs C$36 to C$40 per barrel for a new mining operation. Therefore, although high crude prices make the cost of production very attractive, sudden drops in price leaves producers unable to recover their capital costs—although the companies are well financed and can tolerate long periods of low prices since the capital has already been spent and they can typically cover incremental operating costs. However, the development of commercial production is made easier by the fact that exploration costs are very low. Such costs are a major factor when assessing the economics of drilling in a traditional oil field. The location of the oil deposits in the oil sands are well known, and an estimate of recovery costs can usually be made easily. There is not another region in the world with energy deposits of comparable magnitude where it would be less likely that the installations would be confiscated by a hostile national government, or be endangered by a war or revolution. As a result of the oil price increases since 2003, the economics of oil sands have improved dramatically. At a world price of US$50 per barrel, the NEB estimated an integrated mining operation would make a rate return of 16 to 23%, while a SAGD operation would return 16 to 27%. 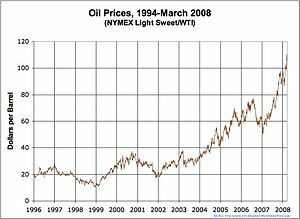 Prices since 2006 have risen, exceeding US$145 in mid-2008 but falling back to less than 40 US$ as a result of the worldwide financial crisis, the oil price recovered slowly and many of the planned projects (expected to exceed C$100 billion between 2006 and 2015) were stopped or scheduled. In 2012 and 2013 the oil price was high again, but the US production is increasing due to new technologies, while the gasoline demand is falling, so there is an overproduction of oil. But recovering economy can change this in a few years. At present the area around Fort McMurray has seen the most effect from the increased activity in the oil sands. Although jobs are plentiful, housing is in short supply and expensive. People seeking work often arrive in the area without arranging accommodation, driving up the price of temporary accommodation. The area is isolated, with only a two-lane road, Alberta Highway 63, connecting it to the rest of the province, and there is pressure on the government of Alberta to improve road links as well as hospitals and other infrastructure. Despite the best efforts of companies to move as much of the construction work as possible out of the Fort McMurray area, and even out of Alberta, the shortage of skilled workers is spreading to the rest of the province. Even without the oil sands, the Alberta economy would be very strong, but development of the oil sands has resulted in the strongest period of economic growth ever recorded by a Canadian province. The Athabasca oil sands are often a topic in international trade talks, with energy rivals China and the United States negotiating with Canada for a bigger share of the rapidly increasing output. Production is expected to quadruple between 2005 and 2015, reaching 4 million barrels (640,000 m3) a day, with increasing political and economic importance. Currently, most of the oil sands production is exported to the United States. An agreement has been signed between PetroChina and Enbridge to build a 400,000 barrels per day (64,000 m3/d) pipeline from Edmonton, Alberta, to the west coast port of Kitimat, British Columbia. If it is built, the pipeline will help export synthetic crude oil from the oil sands to China and elsewhere in the Pacific. However, in 2011, First Nations and environmental groups protested the proposed pipeline, stating that its construction and operation would be destructive to the environment. First Nations groups also claim that the development of the proposed pipeline is in violation of commitments that the Government of Canada has made through various Treaties and the UN Declaration of the Rights of Indigenous Peoples. A smaller pipeline will also be built alongside to import condensate to dilute the bitumen. Sinopec, the largest refining and chemical company in China, and China National Petroleum Corporation have bought or are planning to buy shares in major oil sands development. On August 20, 2009, the U.S. State Department issued a presidential permit for an Alberta Clipper Pipeline that will run from Hardisty, Alberta to Superior, Wisconsin. The pipeline will be capable of carrying up to 450,000 barrels (72,000 m3) of crude oil a day to refineries in the U.S. It does not appear likely that the conditions of the country on either side of the Athabasca and Slave Rivers or about Athabasca Lake will be so changed as to affect hunting or trapping, and it is safe to say that so long as the fur-bearing animals remain, the great bulk of the Indians will continue to hunt and to trap. We had to solemnly assure them that only such laws as to hunting and fishing as were in the interest of the Indians and were found necessary in order to protect the fish and fur-bearing animals would be made, and that they would be as free to hunt and fish after the treaty as they would be if they never entered into it. ... It does not appear likely that the conditions of the country on either side of the Athabasca and Slave Rivers or about Athabasca Lake will be so changed as to affect hunting or trapping, and it is safe to say that so long as the fur-bearing animals remain, the great bulk of the Indians will continue to hunt and to trap. The Fort McKay First Nation has formed several companies to service the oil sands industry and will be developing a mine on their territory. Opposition remaining within the First Nation focuses on environmental stewardship, land rights, and health issues, like elevated cancer rates in Fort Chipewyan and deformed fish being found by commercial fishermen in Lake Athabasca. The Alberta Cancer Board published research of the cancer rates of those living in Fort Chipewyan, Alberta in 2009. While many companies argue that there are not enough chemicals and toxic material in the water due to the development of the oil sands, this report indicates that there is coincidentally a significantly higher rate of cancer within this community. There have been many speculations as to why there is a higher rate of cancer in this community; some of those speculations are contamination with the river and the oil sands as well as uranium mining that is currently in progress. The world's largest production of uranium is produced in this area as well as along the Athabasca River, allowing for easy contamination of the river. Pipeline development poses significant risks to the cultural, social, and economic way of life of Canada's Indigenous populations. Historically, many Indigenous groups have opposed pipeline development for two primary reasons: 1) the inherent environmental risks associated with transporting harmful oil and gas products, and 2) failure by the federal government to properly consider and mitigate Indigenous groups' concerns regarding resource development on their lands. For instance, many Indigenous groups rely heavily on local wildlife and vegetation for their survival. Increased oil production in Canada requires greater oil transport through their traditional lands, which poses serious threats to the survival and traditional way of life of Indigenous groups, as well as the safety and preservation of the surrounding ecosystems. As well, First Nation's in Alberta have called particular attention to adverse health impacts related to oil sands emissions, asserting that the water quality testing for specific chemicals (heavy metals) has been insufficient. Aside from environmental concerns, many Indigenous groups have pushed back against pipeline development due to inadequate consultation processes by the federal government. As per Section 35 of the Canadian Constitution Act Indigenous peoples in Canada are guaranteed the right to be meaningfully consulted with and accommodated when the Crown is contemplating resource development on their lands - see Duty to Consult. Through a series of Supreme Court of Canada rulings and political protests from Indigenous peoples (see Haida Nation v. British Columbia [Minister of Forests], Taku River Tlingit First Nation v British Columbia, and Tsilhqot'in Nation v British Columbia), among others, the courts have attempted to further define the Crown's consultation responsibilities and give legal recognition to Indigenous traditional territory and rights regarding resource development. Contrarily, oil sands development also presents many positive impacts and opportunities for Indigenous groups, particularly in Western Canada. In fact, over the past two decades, First Nations participation in the energy sector has increased dramatically, from employment and business opportunities to project approval processes and environmental evaluation. Increased Indigenous participation has been encouraged by numerous collaboration agreements with industry, typically in the form of impact benefit agreements (IBAs), which provide not only employment and business ventures, but also job training and community benefits. Enhanced participation in the energy sector has empowered many Indigenous groups to push for wider involvement by negotiating ownership stakes in proposed pipelines and bitumen storage projects. Perhaps the best example of such partnering in Alberta is the agreement between Suncor and Fort McKay and Mikisew Cree First Nations. The two First Nations acquired a 49% ownership in Suncor's East Tank Farm Development with shares valued at about $500 million making it the largest business investment to date by a First Nation entity in Canada. Support for resource development and desire for direct involvement is further illustrated by the First Nations' led $17-billion Eagle Spirit Energy Holding Ltd. pipeline and energy corridor between Alberta and the northern B.C. coast (with a back-up plan to site its terminal in Alaska to get around the tanker ban in B.C.). The project has secured support from 35 First Nations along the proposed route; the bands are entitled to at least 35% ownership in exchange for the land use. Planned mining operation oil production by various companies. Data from table below. There are currently three large oil sands mining operations in the area run by Syncrude Canada Limited, Suncor Energy and Albian Sands owned by Shell Canada, Chevron, and Marathon Oil Corp.
Suncor Energy's Steepbank and Millennium mines currently produce 263,000 barrels per day (41,800 m3/d) and its Firebag in-situ project produces 35,000 bbl/d (5,600 m3/d). It intends to spend 3.2 billion to expand its mining operations to 400,000 bbl/d (64,000 m3/d) and its in-situ production to 140,000 bbl/d (22,000 m3/d) by 2008. Syncrude's Mildred Lake and Aurora mines currently can produce 360,000 bbl/d (57,000 m3/d). Shell Canada currently operates its Muskeg River Mine producing 155,000 bbl/d (24,600 m3/d) and the Scotford Upgrader at Fort Saskatchewan, Alberta. Shell intends to open its new Jackpine mine and expand total production to 500,000 bbl/d (79,000 m3/d) over the next few years. Nexen's in-situ Long Lake SAGD project is now producing 70,000 bbl/d (11,000 m3/d). Plans to expand it to 240,000 bbl/d (38,000 m3/d) have been made. Expansion plans were delayed in early 2009. CNRL's $8 billion Horizon mine is planned to produce 110,000 bbl/d (17,000 m3/d) on startup in mid-2009 and grow to 300,000 bbl/d (48,000 m3/d) by 2010. Total S.A.'s subsidiary Deer Creek Energy was operating a SAGD project on its Joslyn lease, producing 10,000 bbl/d (1,600 m3/d). It intended on constructing its mine by 2010 to expand its production by 100,000 bbl/d (16,000 m3/d), however this had not occurred by May 2014 when the company shelved the project while it reviewed the economic viability of the project. Imperial Oil's 4.6 billion barrel Kearl Oil Sands Project is projected to start construction in 2008 and produce 110,000 bbl/d (17,000 m3/d) by the end of 2012. Imperial also operates a 160,000 bbl/d (25,000 m3/d) in-situ operation in the Cold Lake oil sands region. Synenco Energy and SinoCanada Petroleum Corp., a subsidiary of Sinopec, China's largest oil refiner, had agreed to create the 3.5 billion Northern Lights mine, projected to produce 100,000 bbl/d (16,000 m3/d) by 2009. This project has since been indefinitely deferred (as of 2007). North American Oil Sands Corporation (NAOSC), a subsidiary of Statoil, is expected to produce in the Kai Kos Dehseh project around 100,000 bbl/d (16,000 m3/d) by 2015. It is expected to ramp up production to around 100,000 barrels per day (16,000 m3/d) by around 2015. For improper diversion of water in 2008/2009, Statoil Canada Ltd. was ordered in 2012 to pay a fine of $5000 and to allocate $185,000 for a training project (The verdict was handed down by the Provincial Court of Alberta, Criminal Division). ^ IHS CERA (May 18, 2009). "Oil Sands Move from the 'Fringe to Center' of Energy Supply". RigZone. Archived from the original on 21 May 2009. Retrieved 2009-05-19. ^ a b Mather, Clive "The Oil Sands of Alberta" on YouTube, Canada Broadcasting Corporation. ^ a b "Alberta's Oil Sands 2006" (PDF). Government of Alberta. 2007. Archived from the original (PDF) on 2008-02-27. Retrieved 2008-02-17. ^ "Steam-Assisted Gravity Drainage (SAGD)". Cenovus. On this site is a Cenovus animation on how SAGD works. ^ "What are Oil Sands?". CAPP. 2009. ^ a b "Alberta Plan Fails to Protect Athabasca River". Archived from the original on 2007-04-26. Retrieved 2007-04-01. ^ a b "Alberta's tar sands are soaking up too much water". The Globe and Mail. Dogwood Initiative. 2006-07-05. Archived from the original on 2007-07-09. Retrieved 2007-04-01. ^ a b "'Conspiracy of silence' on tarsands, group says". CTV News. Archived from the original on 20 February 2008. Retrieved 2008-02-16. ^ a b "Tar won't stick". Edmonton Journal. Retrieved 2008-02-16. ^ Mackenzie, Sir Alexander (1970). "The Journals and Letters of Alexander Mackenzie". Edited by W. Kaye Lamb. Cambridge: Hakluyt Society, p. 129, ISBN 0-521-01034-9. ^ a b Hein, Francis J. (2000). "Historical Overview of the Fort McMurray Area and Oil Sands Industry in Northeast Alberta" (PDF). Earth Sciences Report 2000–05. Alberta Geological Survey. Archived from the original (PDF) on 27 February 2008. Retrieved 2008-02-17. ^ "Oil Sands History". Unlocking the Potential of the Oil Sands. Syncrude. 2006. Archived from the original on 2007-09-27. Retrieved 2008-02-17. ^ a b Cameron, Agnes Deans (1909). The New North: Being Some Account of a Woman's Journey through Canada to the Arctic. New York: Appleton. ^ "Cameron, Agnes Deans (1863–1912)". ABC Book World. ^ a b c Mike Gismondi; Debra J. Davidson (September 2012). "Imagining the Tar Sands: 1880 -1967 and Beyond" (PDF). Imaginations. Edmonton, Alberta: Campus Saint-Jean, University of Alberta. pp. 68–102. Archived from the original (PDF) on 2013-10-02. ^ Petroleum History Society Archives Newsletter, June 2005, retrieved 2012-10-28. ^ October Bulletin of the Atomic Scientists October 1976, p. 23. ^ Bray, B. G.; Knutson, C. F.; Coffer, H. F. (5 November 1968). "Process for Stimulating Petroliferous Subterranean Formations with Contained Nuclear Explosions". Retrieved 6 July 2016 – via www.osti.gov. ^ "Process for stimulating petroliferous subterranean formations with contained nuclear explosions" (PDF). ^ Les Adler. "America's Tar Baby". ^ "Project Oilsand". Government of Alberta. Retrieved 2016-07-24. ^ "Petroleum History Society Archives Newsletter June 2005" (PDF). Retrieved 2016-07-21. ^ "EcoNews, Serving the Vision of a Sustainable Vancouver Island". Earthfuture.com. Retrieved 2016-07-21. ^ Pratt, Michael (October 3, 2015). "Alberta's oilsands almost saw nuclear detonation to free up trapped bitumen as part of Operation Cauldron in the 1950s". Calgary Sun. Archived from the original on 2016-01-27. Retrieved 2016-07-24. ^ Milo D. Nordyke, 2000. peaceful nuclear explosions (PNEs) in the Soviet Union over the period 1965 to 1988. ^ Pitts, Gordon (25 August 2012). "The man who saw gold in Alberta's oil sands". The Globe and Mail. Toronto. Retrieved 27 August 2012. Sixty-one years ago, a lowly Calgary employee of U.S. multinational Sun Oil Co. wrote a subversive letter to the company brass in Philadelphia. The message spit in the eye of his local managers in Alberta: "I have long felt that our company should take a permit to explore for oil from the Tar Sands of Alberta," 30-year-old Ned Gilbert wrote in September, 1951, in defiance of his immediate superiors, who opposed the idea of going any further than their first tentative steps in the area. Suncor has emerged as the elite player among Canadian-controlled oil companies, valued at almost $50-billion. (Sun Oil divested its stake in the company in the early 1990s.) Suncor's pre-eminence stems directly from Great Canadian Oil Sands, the first commercial oil sands project, which was launched by Sun Oil in 1967. ^ "Suncor, Petro-Canada announce merger". CBC News. 2009-03-23. Retrieved 2009-12-08. ^ "Suncor, Petro Canada complete merger". bizjournals. 2009-08-06. Retrieved 2009-08-11. ^ "Petro Canada: Legal & Privacy". Petro Canada. Retrieved 2016-07-22. ^ Bjorkman, James. "Alberta Tar Sands Explained - An Informative Animation". Animated Film Reviews. Retrieved 2014-05-17. ^ Dusseault, M.B. (June 2001). "Comparing Venezuelan and Canadian Heavy Oil and Tar Sands" (PDF). Alberta Energy. Canadian Institute of Mining, Metallurgy & Petroleum. Retrieved 2014-04-21. ^ "Oil Sands". Alberta Energy. Alberta Government. 2008. Archived from the original on 21 February 2008. Retrieved 2008-01-30. ^ "Facts and Statistics". Alberta Energy. Alberta Government. 2008. Retrieved 2013-01-31. ^ "Canada's Oily Sands Yield Energy and Protests" article by Hillary Brenhouse in The New York Times October 11, 2010, accessed October 12, 2010. ^ "Oil sands bitumen to flow to West Coast by 2015: Enbridge" article by Shawn McCarthy in The Globe and Mail April 29, 2010, updated Monday, May. 17, 2010, accessed October 12, 2010. ^ "Oil sands awash in excess pipeline capacity" article by Nathan VanderKlippe in The Globe and Mail April 23, last updated Tuesday, October 5, 2010, accessed October 12, 2010. This article contains an informative map of existing and projected oil pipelines. ^ Jeffrey Jones (May 16, 2012). "C$2.6 bln for Eastern Access, C$600 mln for mainline". Reuters. Retrieved June 14, 2012. ^ Elisabeth Rosenthal (June 13, 2012). "Canada Seeks Alternatives to Transport Oil Reserves". The New York Times. Retrieved June 14, 2012. ^ "Oil sands & western Canadian conventional production, December 2008 interim update". Canadian Association of Petroleum Producers. 2008-12-11. Archived from the original on September 28, 2007. Retrieved 2009-01-03. ^ Franklin, Sonja; Gismatullin, Eduard (2007-12-05). "BP, Husky Energy agree to form oil-sands partnerships". Bloomberg. Retrieved 2007-12-12. ^ Dutta, Ashok (2007-12-12). "ConocoPhillips aims high". Calgary Herald. Retrieved 2007-12-12. ^ Alberta, Employment, Immigration and Industry (December 2007). "Alberta Oil Sands Industry Update" (PDF). Government of Alberta. Archived (PDF) from the original on 2008-04-09. Retrieved 2008-04-01. ^ "Cenovus has 4 industry leading oil sands producing projects". Retrieved 6 July 2016. ^ "Cenovus snaps up ConocoPhillips assets for $17.7-billion". The Globe & Mail. March 29, 2017. Retrieved January 29, 2018. ^ "Home". Retrieved 6 July 2016. ^ "synenco.com". Retrieved 6 July 2016. ^ Heavy Investment – Statoil arrives in the oil sands – WoodMackenzie, Upstream Insight, May 2007. ^ Livingston, W. S. (March 1952). "A Note on the Nature of Federalism". Political Science Quarterly. 67 (1): 81–95. doi:10.2307/2145299. JSTOR 2145299. ^ Cairns, R. D. (1992). "Natural Resources and Canadian Federalism: Decentralization, Recurring Conflict, and Resolution". The Journal of Federalism. 22 (1): 55–70. doi:10.2307/3330233. JSTOR 3330233. ^ Chastko, P. (2004). Developing Alberta's Oil Sands: From Karl Clark to Kyoto. Calgary: University of Calgary Press. ^ Taylor, A (2006). Thinking Like an Owner: Fact Sheet – Overhauling the royalty and tax treatment of Alberta's oil sands. Drayton Valley, Alta: The Pembina Institute. ^ Council of Canadians (2007). Submission to the Alberta Royalty Review Panel presented by Lyn Gorman on behalf of the Council of Canadians. Ottawa: Council of Canadians. ^ a b c Phillips, Jeffrey P. T. "Multistakeholderism in Oil Sands Governance". SSRN. SSRN 1140304. ^ Alberta Royalty Review Panel (18 September 2007). "Our Fair Share". Alberta Royalty Review Panel. ^ Oil Sands InfoMine. "Oil Sands Company/Property Mine". Archived from the original on 2011-04-30. Retrieved 1 April 2011. ^ Crane, D (1982). Controlling Interest: The Canadian Gas and Oil Stakes. Toronto: McClelland and Stewart Limited. ^ Vlavianos, N. (August 2007). "The Legislative and Regulatory Framework for Oil Sands Development in Alberta: A Detailed Review and Analysis". Canadian Institute of Resources Law. 21. ^ Government of Alberta (December 2005). "Terms of Reference – Oil Sands Consultation Group – Background". Government of Alberta. ^ Government of Alberta. "News Release. Final oil sands reports set a framework for the future". Archived from the original on 2011-10-06. Retrieved 2 April 2011. ^ Government of Alberta Alberta to establish arm's-length environmental monitoring agency Retrieved (2012-10-21). ^ Financial Post. Canada launches new oil sands monitoring policy Retrieved 21 October 2012. ^ "Strong team leads Alberta Energy Regulator". Edmonton, Alberta: Government of Alberta. 12 June 2013. ^ a b Pratt, Sheila (18 June 2013). "Critics want Alberta's new energy regulator removed". Edmonton Journal. Archived from the original on 22 May 2013. Retrieved 22 June 2013. ^ "The Alberta Energy Regulator" (PDF). The Alberta Energy Regulator (AER). 2013. Archived from the original (PDF) on 2014-04-21. ^ a b c "Regulatory Enhancement Project". Alberta Energy. 12 June 2013. ^ Maximum fines under the Responsible Energy Development Act are limited to C$500,000 or less for a corporation and $50,000 or less for an individual. ^ Nikiforuk, A. (2008). Tar Sands: Dirty Oil and the Future of a Continent. Vancouver: Greystone Books. ISBN 978-1-55365-407-0. ^ "Oil Sands". Retrieved 2013-01-31. ^ "Syncrude buys Bucyrus 495". Bucyrus. Archived from the original on 2012-04-25. Retrieved 2014-04-16. ^ "Canadian Oil Sands provides 2008 Budget". Canadian Oil Sands Trust. 2007. Archived from the original on 2008-02-16. Retrieved 14 May 2008. ^ "The oil sands story: extraction". Oil Sands Discovery Centre. Archived from the original on 25 March 2009. Retrieved 9 April 2009. ^ "AOSTRA-Taciuk Process (ATP)". Government of Alberta. Archived from the original on 4 March 2009. Retrieved 25 December 2008. ^ "Alberta Inventors and Inventions—Karl Clark". Archived from the original on 5 March 2006. Retrieved 2006-03-29. ^ Gu, G.; Xu, Z.; Nandakumar, K.; Masliyah, J. H. (2002). "Influence of water-soluble and water-insoluble natural surface active components on the stability of water-in-toluene-diluted bitumen emulsion". Fuel. 81 (14): 1859–1869. doi:10.1016/s0016-2361(02)00113-8. ^ Mikula, R. J.; Omotoso, O.; Friesen, W. I. (2007). "Interpretation of Bitumen Recovery Data from Batch Extraction Tests". Canadian Journal of Chemical Engineering. 85 (5): 765–772. doi:10.1002/cjce.5450850522. ^ "Dr. Roger M. Butler". Canadian Petroleum Hall of Fame. 2012. ^ C.V. Deutsch; J.A. McLennan (2005). "Guide to SAGD (Steam Assisted Gravity Drainage) Reservoir Characterization Using Geostatistics" (PDF). Centre for Computational Geostatistics. Archived from the original (PDF) on 9 December 2008. Retrieved 1 December 2008. ^ Jyotsna Sharma; Ian Gates (August 2011). "Convection at the edge of a steam-assisted-gravity-drainage steam chamber". SPE Journal. Society of Petroleum Engineers. 16 (3): 503–512. doi:10.2118/142432-PA.
^ "Canada's Energy Future: Reference Case and Scenarios to 2030" (PDF). pp. 45–48. ISBN 978-0-662-46855-4. ^ "Questions and Answers". Canada's Oil Sands—Opportunities and Challenges to 2015: An Update. National Energy Board of Canada. 2007-06-30. Retrieved 2007-08-23. ^ "Alberta Energy: Facts and Statistics". Alberta Energy. ^ "Environmental Protection and Enhancement". Alberta Environment. Archived from the original on 2007-04-16. Retrieved 2007-04-04. ^ "Syncrude Land Reclamation". Syncrude Canada. 2006. Retrieved 2009-08-07. ^ "Reclamation illusions in oil sands country". Parkland Institute. 2008. Archived from the original on 2011-10-28. Retrieved 2011-08-13. ^ "Primer". Environment Canada. Archived from the original on 2006-09-24. Retrieved 2008-04-16. ^ "Athabasca river water management framework". Archived from the original on 2008-06-02. Retrieved 2008-04-16. ^ "Typical River Flows". Environment Canada. Archived from the original on 2006-09-24. Retrieved 2008-12-13. ^ "Environmental Aspects of Oil Sands Development-Backgrounder". Canadian Association of Petroleum Producers. Archived from the original (PDF) on 2008-12-11. Retrieved 2008-12-13. ^ "Athabasca River Water Management Framework". Alberta Environment. Archived from the original on 2007-05-14. Retrieved 2007-04-04. ^ "Enhancing Resilience in a Changing Climate, Water Supply for Canada's Oil Sands". Natural Resources Canada. Archived from the original on 2008-06-02. Retrieved 2008-04-16. ^ L.T Waller (2008). "We can no longer be sacrificed". Political Science. Briarpatch Inc.
^ Erin N. Kelly; David W. Schindler; Peter V. Hodson; Jeffrey W. Short; Roseanna Radmanovich; Charlene C. Nielsen (2010). "Oil sands development contributes elements toxic at low concentrations to the Athabasca River and its tributaries". Proceedings of the National Academy of Sciences of the United States of America. 107 (37): 16178–16183. Bibcode:2010PNAS..10716178K. doi:10.1073/pnas.1008754107. PMC 2941314. PMID 20805486. ^ McColl, David; Slagorsky, Martin (November 2008). Canadian Oil Sands Supply Costs and Development Projects. Canadian Energy Research Institute. ISBN 1-896091-83-0. ^ Gardner, Timothy (2009-05-18). "Canada oil sands emit more CO2 than average: report". Reuters. Retrieved 2011-08-27. ^ Strahan, David (2009-12-08). "Who's afraid of the tar sands?". DavidStrahan.com. Archived from the original on 26 July 2011. Retrieved 2011-08-27. ^ "Carbon Capture and Storage" October 2009. ^ SK Wasser, JL Keim, ML Taper, SR Lele. 2011. The influences of wolf predation, habitat loss, and human activity on caribou and moose in the Alberta oil sands. Frontiers in Ecology and the Environment. ^ "Oil sands death of hundreds of ducks in 2010 blamed on weather, no charges laid". Retrieved 6 July 2016. ^ K.P. Timoney (September 2010). "Annual Bird Mortality in the Bitumen Tailing Ponds in northeastern Alberta, Canada". The Wilson Journal of Ornithology: 569–576. ^ L.T. Waller (2008). "We can no longer be sacrificed". Political Science. Briarpatch Inc.
^ "Two-mouth fish fuels oil-sands health fears; Cree suspect mutation linked to contamination of Alberta waterways". Toronto Star. 20 August 2008. Retrieved 5 February 2013. ^ J. Couture (March 2008). "Health concerns rise over oil sands pollution: Aboriginal Multi-Media Society of Alberta". Windspeaker. Retrieved 5 February 2012. ^ "Suncor speeds tailings-pond reclamation". Oil & Gas Journal. Houston: PennWell Corporation. 23 October 2009. Retrieved 23 October 2009. ^ Kurek, J.; Kirk J.L. ; Muir D.C.G. ; Wang X.; Evans M.S. ; Smol J.P. (2013). "Legacy of a half century of Athabasca oil sands development recorded by lake ecosystems" (PDF). Proceedings of the National Academy of Sciences of the United States of America. National Academy of Sciences of the United States of America. 110 (5): 1–6. Bibcode:2013PNAS..110.1761K. doi:10.1073/pnas.1217675110. PMC 3562817. PMID 23297215. Retrieved 9 January 2013. ^ Austen, Ian (7 January 2013). "Oil Sand Industry in Canada Tied to Higher Carcinogen Level". The New York Times. ^ "Nexen's oil sands pipeline leak one of Canada's largest ever - MINING.com". 17 July 2015. Retrieved 6 July 2016. ^ Wall Street Journal, January 18, 2016 "Search for Clues After Deadly Blast at Nexen Oil-Sands Plant Unit of China's Cnooc shut facility after the accident Friday killed one and injured another "
^ Wall Street Journal, January 2016 "Cnooc Oil-Sands Operation in Canada to Remain Shut After Explosion"
^ Planning and Development Department (2006). "Municipal Census 2006" (PDF). Regional Municipality of Wood Buffalo. Archived from the original (PDF) on 27 February 2008. Retrieved 2008-02-06. ^ "Order in Council (O.C.) 817/94" (PDF). Province of Alberta. 1994-12-21. Retrieved 2012-01-17. ^ Department of Energy, Alberta (June 2006). "Oil Sands Fact Sheets". Retrieved 2007-04-11. ^ Canada, Statistics (April 5, 2007). "Latest release from the labour force survey". Archived from the original on 6 April 2007. Retrieved 2007-04-11. ^ "Why Venezuela is Alberta's biggest competitor". Oil Sands Magazine. Retrieved 2018-02-09. ^ a b NEB (June 2006). "Canada's Oil Sands Opportunities and Challenges to 2015: An Update" (PDF). National Energy Board of Canada. Archived from the original on 2006-05-08. Retrieved 2006-10-30. ^ Nikiforuk, Andrew (2006-06-04). "The downside of boom: Alberta's manpower shortage". Canadian Business magazine. Archived from the original on 2006-10-19. Retrieved 2006-10-30. ^ Statistics Canada (2006-09-14). "Study: The Alberta economic juggernaut". Statistics Canada. Archived from the original on 12 October 2006. Retrieved 2006-10-30. ^ "Enbridge and PetroChina Sign Gateway Pipeline Cooperation Agreement | Business Wire | Find Articles at BNET". Findarticles.com. 2005-04-14. Retrieved 2010-06-02. ^ CBC News (2011-05-11). "First Nations group protests pipeline proposal". Archived from the original on 20 July 2011. Retrieved 6 June 2011. ^ "Permit for Alberta Clipper Pipeline Issued". State.gov. 2009-08-20. Archived from the original on 28 May 2010. Retrieved 2010-06-02. ^ "U.S. Department of State". Albertaclipper.state.gov. Archived from the original on 2010-06-03. Retrieved 2010-06-02. ^ Droitsch, Danielle; Simieritsch, Terra (2010). "Canadian Aboriginal Concerns with Oil Sands" (PDF). Pembina Institute. ^ Oil Sands Projects Oilsands Discovery Archived 2006-03-28 at the Wayback Machine. ^ "Cost escalation leads Total to put Joslyn oil sands project on hold". Edmonton Journal. Retrieved 14 June 2014. ^ Wojciech Moskwa (2007-04-27). "Statoil to buy North American Oil Sands for 2 bln". Financial Post. Archived from the original on 2008-06-02. Retrieved 2007-12-09. ^ Final clarification in water issue for Statoil Canada Ltd. accessed 2011-11-01. Kunzig, Robert (March 2009). "The Canadian Oil Boom: Scraping Bottom". National Geographic. 215 (3): 38–59. Retrieved 29 May 2009. 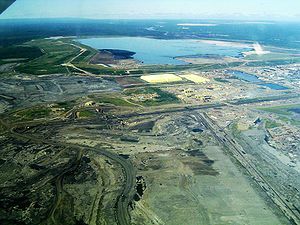 Wikimedia Commons has media related to Athabasca oil sands. (in French) Du sable dans l'engrenage TV document by Guy Gendron and Jean-Luc Paquette describing the Athabasca oil sands issues. Athabasca Oil Sands at NASA Earth Observatory. Includes a series of satellite photos from 1984 to 2011, showing how the project has developed.